Mike Oliver sadly passed away this month. Mike was a pioneer in the discovery of the social model of disability – that you are disabled by the physical and attitudinal barriers society puts in front of you. That same Sunday evening, I was disabled by the very industry I work in. I was attending the WhatsOnStage Awards as the assistant director on Manchester Royal Exchange’s Death of a Salesman, which had been nominated for best regional production. Excited and in my glamorous outfit, I arrived at the Prince of Wales Theatre. But unlike the other nominees, I couldn’t enter via the traditional red carpet – it wasn’t accessible to me as a wheelchair user. I had to use a separate entrance. I had been pre-warned there were steps on the red carpet. What hadn’t been made clear is that the step-free access (which was the main entrance to the theatre) was only yards away from where my fellow nominees were entering, greeting and congratulating each other. That was my first barrier, and it didn’t stop there. If we had won, I wouldn’t have been able to ascend the stage to make an acceptance speech – there was no ramp. If I had wanted to celebrate with my peers at the after-party, I couldn’t – the Café de Paris is down two flights of stairs, with no lift. We left at the interval. Sadly, this particular ceremony is not the only one that fails when it comes to providing access to Deaf and disabled actors, directors, writers, creatives, and even paying audience members. At many others, we see nominees use a separate entrance with no red carpet, a sign-language interpreter in the far corner of the stage hidden by dancers, no live captioning and no audio description available. By not being able to use the red carpet, there is no official photograph of me at the event. A photograph is about much more than vanity – it’s an important opportunity to raise the profile of a female disabled theatre director, to promote the representation of disabled people working in the industry. Above all of that, it raises aspirations for every disabled artist who thinks this industry can’t be for them. Instead, it’s like we don’t exist. It’s troubling that access isn’t being thought about at planning meetings. Who is in charge? Is there any Deaf or disabled leadership in the organisations that host them? If there were, I doubt I would be writing this. Engage companies such as Graeae Theatre Company, Attitude Is Everything and Equity’s Deaf and Disabled Members Committee to improve access at these events. All organisations have to start being proactive in making the change. It’s 2019 and I’m bored of not being included or valued. The cultural landscape of British theatre is changing and disabled people are instrumental to that. 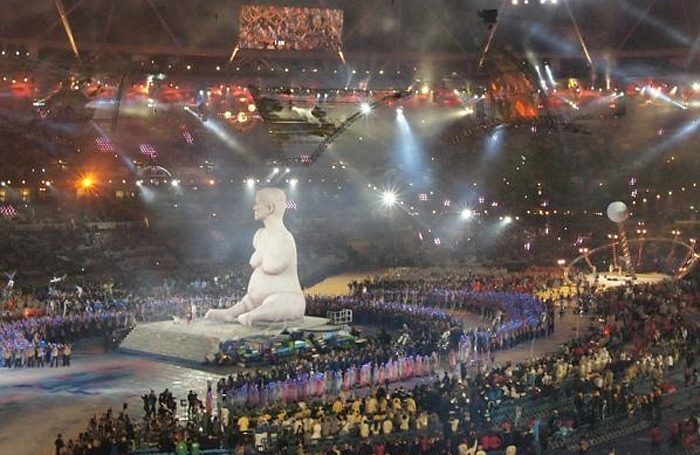 In 2012, I played Miranda in the Paralympics opening ceremony. As I flew out of the stadium that night, past the iconic massive statue of Alison Lapper, I smashed the rhetorical glass ceiling in the hope of making change, that the societal barriers facing disabled people would be removed. I urge everyone: remember that ceremony when you are planning yours.